Song Lyrics: Is there a Planet X? Planet X would be the most significant addition to the solar system since the discovery of Pluto, the now notorious non-planet, in 1930. When the International Astronomical Union voted to downgrade Pluto to dwarf planet status in 2006, they established three criteria for a fully blown planet in our solar system: it must orbit the sun; its gravity must suffice to mould it into a near-spherical shape; and it must be massive enough to have ploughed its orbit clear of other bits and bobs. Pluto falls down on this third point. 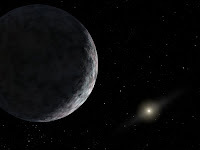 It is just one of many Kuiper belt objects (KBOs), icy bits of debris that pepper space from Neptune's orbit at 30 astronomical units out to around 50 AU, where 1 AU is the distance between Earth and the sun. Any new object would have to be well clear of the Kuiper belt to qualify as a planet. Yet intriguingly, it is studies of the belt that have suggested the planet's existence. Some KBOs travel in extremely elongated orbits around the sun. Others have steep orbits almost at right angles to the orbits of all the major planets. "Those could be signs of perturbation from a massive distant object," says Robert Jedicke, a solar system scientist at the University of Hawaii. That is by no means a general consensus. An early, slow outward migration of the giant planets (see "How was the solar system built?") could also explain some of these strange KBO orbits - although it has difficulty explaining all of the belt's observed properties. Over the past 20 years, huge swaths of the sky have been searched for slowly moving bodies, and well over 1000 KBOs found. But these wide-area surveys can spot only large, bright objects; longer-exposure surveys that can find smaller, dimmer objects cover only small areas of the sky. A Mars-sized object at a distance of, say, 100 AU would be so faint that it could easily have escaped detection. That could soon change. In December 2008, the first prototype of the Panoramic Survey Telescope and Rapid Response System (Pan-STARRS) was brought into service at the Haleakala observatory on Maui, Hawaii. Soon, four telescopes - equipped with the world's largest digital cameras, at 1.4 billion pixels apiece - will search the skies for anything that blinks or moves. Its main purpose is to look out for potentially hazardous asteroids bound for Earth, but inhabitants of the outer solar system will not escape its all-seeing eyes. Jedicke and his team are busy developing software to spot objects automatically using Pan-STARRS. The discovery of a further planet would be thrilling, he says. The only explanation for its presence there would be that large bodies coalesced very early in the solar system's history, only to be ejected by the gravity of the giant planets later on. That would firm up our ideas about how the solar system must have developed, and perhaps be a stepping stone towards its even more distant recesses(see "Where do comets come from? ").